The Octo Support Hoodie is clothing in Splatoon 2. It is a 3-star item produced by SquidForce and comes with the primary ability Main Power Up. It is only available by getting limited gear serial code for purchasing the 4th Splatoon Koshien Fan Book as a Famitsu promotion in Japan. It cannot be ordered through Murch. The Octo Support Hoodie is a long-sleeved zip-up hoodie in a deep pink. On the right side of the hood is a purple octopus. The hood has angry eyes on it, that suggests that if the hood was up, it would appear like an Octoling in octopus form. At the back, there are writings in purple and white. The Octo Support Hoodie comes with a random main ability generated when the item is received. 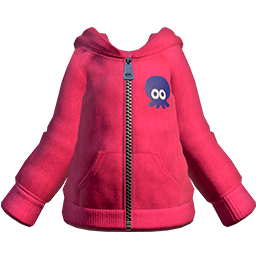 As a 3-star item, the Octo Support Hoodie has three additional slots for secondary abilities. Since it is made by the SquidForce brand, it has a higher chance of rolling Ink Resistance Up and a lower chance of rolling Ink Saver (Main) to fill its secondary ability slots. This page was last edited on 7 March 2019, at 13:19.